Ever wanted a promotion only to hear “You’re not ready, take this training course and then we’ll talk” only to do so and then hear “OK, you took the course, but we will do that next month” only for the next month to come and nothing happens. Even worse, you try to remind the supervisor who made that promise and they tell you “We can’t do that now because…” and then they make yet another promise. Been there. Done that. 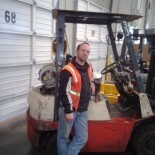 I used to work at a warehouse the specialized in construction supply. I aspired to start working on the retail side and was constantly promised that they would promote me to that position, but never did. Even worse, they would hire an outsider for the position who knew little about the company, its products, or business model, despite my having taking the training for all of that. In the end it was empty promises. Commuting to work, I often see cars with the IXTHUS on the back end. Sometimes there will be some sort of bumper sticker too. Usually something to the effect of “In Case of Rapture, Vehicle Unmanned” or “HSCOMNGBCK”. Yes, these vehicles obviously are, or at least were, owned by Christians. However, it really looks back when you see one of these vehicles doing 85 in a 55 zone and cutting across four lanes of traffic without using a blinker or waiting. So, while they may profess themselves as Christians, their poor behavior in traffic really does make the Christian faith look bad, never mind that the Bible really doesn’t say anything about traffic laws. However, to think you can just break the law, whether man’s law or God’s law, and get away with it because you are forgiven is not just folly, it is hypocrisy. There is a good reason I don’t put Christian emblems or stickers on my car, though HAM radio is another thing. Last night I watched X-Men: First Class. I was underwhelmed. I guess it is because I grew up watching the original cartoon series and read the original Marvel Comics. As anyone who has watched most of the Marvel Comic based movies know, humans and mutants are at odds one with another. However, as revealed in the original cartoon series from 1992, this is not logical. Indeed, Master Mold, the largest of the Sentinels, makes the statement “That is not logical. Mutants are human. Therefore, humans must be protected from themselves.” when told he was supposed to protect humans from mutants. Hypocrisy. Let’s throw down the cards, shall we? I’m a hypocrite. Then again, so are you. In fact, there is not a man or woman alive who is not a hypocrite. Think you are not a hypocrite? Ever did the opposite of what you said you would do? Hypocrite. Yes, we are all hypocrites. Not a single one of us is innocent of this. Jesus understood that quite well when confronting the scribes and the Pharisees. In Matthew 23, Jesus speaks a series of woes against them, recounting their hypocrisy. Yes, even in the church is hypocrisy. I have often encountered people who say “I can not attend church because of the hypocrites”. True, the church is full of hypocrites. I don’t deny that. However, Jesus says very plainly in Luke 2:17 “It is not those who are healthy who need a physician, but those who are sick; I did not come to call the righteous, but sinners.” Jesus was pointing out their hypocrisy to their own spiritual blindness when he was eating with the “sinners”, whom the priests felt were less worthy. That same hypocrisy is at work today. Yes, the church is full of hypocrites. However, as a beloved retired pastor once said “yes, the church is full of hypocrites and there is always room for one more”. To that end, the church is like unto a hospital, where the sick go for healing. Hypocrisy is not a good thing. I can admit to that. However, in my humanity, I will remain a hypocrite. However, I am forgiven, but that does not give me a license to continue being a hypocrite. Rather, it is for that reason that I strive to not be so hypocritical. That is the reason for repentance and why Christ Jesus died upon the cross for our sins. Our hypocrisy as humans makes it impossible for us to do as God has called us to do. In our hypocrisy, we deny our sinful nature and try to make ourselves greater than we truly are. We all do it. If any of us could truly be righteous without being a sinful hypocrite, then Jesus would not have needed to die and rise again. There is a popular meme floating around Facebook right now. It has a picture of a boat in the water and it reads “Religion is a man sitting in church and thinking about fishing, relation is a man sitting in a boat fishing and thinking about God”. WRONG! HYPOCRITE! The sad simple truth is that a man sitting in a boat fishing is not necessarily thinking about God. Worse, it is unlikely that they are even reading the Bible or listening to a Bible based radio program or sermon. In fact, the only thing that is likely to be on their mind is how big that next catch will be. I know. I’ve been there. The only “god” that you care about if you’d rather be in a boat fishing rather than in church is yourself. If that is the case, you have a sad and pathetically weak god, who ultimately will only serve to drive you away from the one true God. Yes, I am a hypocrite. You are too. I have days where I don’t want to attend church. However, I still go. I am still a sinful human living in a fallen world. So are you. Its time to acknowledge that hypocrisy, which exists in us all, and then return to the church, the only place where true healing can occur. Sin and hypocrisy can not be cured by man’s efforts, but rather by the word of God through the Holy Spirit. There is no other way. We are all hypocrites and we all encounter hypocrisy in others. Sin is still sin. Hypocrisy is a sin. Empty promises and false and/or poor representations are hypocrisy. Forsaking fellowship with other believers because “I can worship God anywhere” is hypocrisy and only leads to self idolatry. Don’t want to be a hypocrite? Stop. Repent. Return. Jesus can forgive even the most reprobate of hypocritical sinners, if they are truly penitent. Better to be a repentant hypocrite attending church than an unrepentant reprobate and burn in Hell. The church is waiting, please come back. Jesus has called you, now is the time to answer. You may not have tomorrow. This entry was posted on 18/05/2014 by Christopher Rose in Uncategorized and tagged bumper sticker, Christian, empty promises, Gospel of Luke, Gospel of Matthew, Hypocrisy, hypocrite, Idolatry, Jesus, X-men.